Muthupet is located in Tamil Nadu’s Thiruvarur district, some 360 km south of Chennai. It is adjacent to the Bay of Bengal, at the southernmost part of the Cauvery delta. Lagoons and mangrove forests abound. It is an area rich in fish. The man before us was born and brought up in Muthupet. We were at the popular restaurant at Bengaluru’s Kanteerava Stadium; the eve of the city’s 2016 marathon. There was a steady stream of runners proceeding to collect their bibs. Many of them stopped at the restaurant for a cup of tea and small talk. 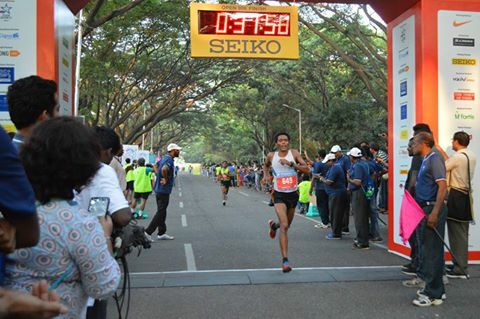 The previous year – 2015 – Idris Mohamed had finished second in his age category in the half marathon segment at Bengaluru. And that is just one of several podium finishes, the wiry man from Muthupet had been notching up in races across India. Back home, he hailed from a big family. “ I am one of ten children; I have six brothers and three sisters. I was the most active of the lot, given to sports although not the sort winning prizes at school or anything like that,’’ he said. Following school, Idris moved from the coast to Dindigul near Madurai, in the interiors of Tamil Nadu, to study textile engineering at the SSM Institute of Technology and Engineering. For a while thereafter, he worked as an apprentice at a company in Coimbatore. In due course, given a brother, who had opted to work in Dubai, Idris too, shifted overseas. “ I remained in Dubai for eight years,’’ he said. Despite his background in textile engineering, when it came to livelihood, the man from Muthupet found himself in sales and marketing. Work days were long and involved taking clients out and entertaining them to clinch a deal, resulting perhaps in a sense of life as a lot of time requiring to be spent somehow. Liking badminton, he often played the game. He also enjoyed walking and the occasional jog. There was nothing yet to indicate a later passion for running. In 1996, he got married. From 1996 to July 2014, he worked in Bahrain. “ During that phase, I gained a lot of weight,’’ Idris said, “ I was close to 90 kilos.’’ To tackle the predicament, he took up running. “ It took me six months to be able to run non-stop for three to four minutes,’’ Idris said. Soon he became member of a club called Bahrain Road Runners (BRR – according to one website, it has its roots in an earlier outfit started by expats in 1972, with its first marathon organized in 1979 to mark the Bahrain visit of Queen Elizabeth II). Every weekend, they had races. “ I never missed a weekend run,’’ he said. Although he was running with BRR, Idris didn’t have a coach keeping an eye on him. His passage in running was by trial and error. Like most rookies, he ran without adequate warm up and stretching. Within a few months he suffered major injuries. “ It put me out of action for almost a year and a half,’’ he said. Lesson learnt, he began warming up and stretching, embarking eventually on a period of running that has since stayed injury-free. In 2002, for the first time he ran a half marathon; it was the first evidence he got that he had the capability to run 21 km. He finished the 21 km in 1:45. “ That was when they said: you have talent in running. Since then I haven’t looked back; I have been running, cycling and swimming,’’ Idris said. 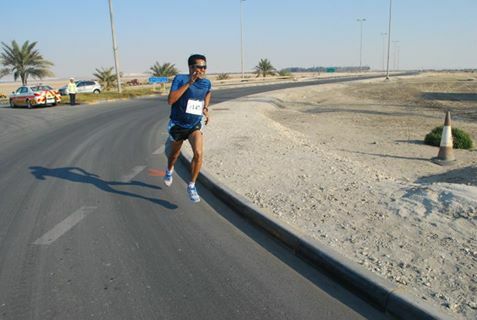 In 2003, he ran that year’s edition of the Bahrain International Marathon. It is considered to be the oldest marathon in the Middle East. Now weighing around 70 kilos and well into running, Idris completed the marathon in 3:35. As always happens, the running bug started working on Idris Mohamed. And as typically follows, the wife took some time understanding husband’s emergent eccentricity. Afroz Banu had her concerns but eventually gave in. Idris spoke honestly. “ For Indians, particularly runners, once you get married, it is an uphill task overcoming the pressure in this department. It is a challenge. It took me three years to convince my wife about my interest in running. There are friends of mine who like running but don’t find time for it because of family commitments. I was lucky after those three years,’’ he said. The shape of runner Idris has evolved to tracked his circumstances. BRR used to host triathlons – that probably explains the regimen of running, cycling and swimming he came to follow. In 2010, when Indians at triathlons was yet a small number, he participated in an Ironman event in Malaysia completing it in under-14 hours. He funded the participation himself. It was a straight plunge into the full Ironman format without any attempt at a half, before. The event in Malaysia was a struggle. Idris had commenced swimming seriously in 2004. Twice a month he used to swim in the sea off Bahrain. “ It is a relatively calm sea. You don’t find waves there,’’ he said. He found for himself a stretch where he could swim 400 m across and back. His weakness was cycling. 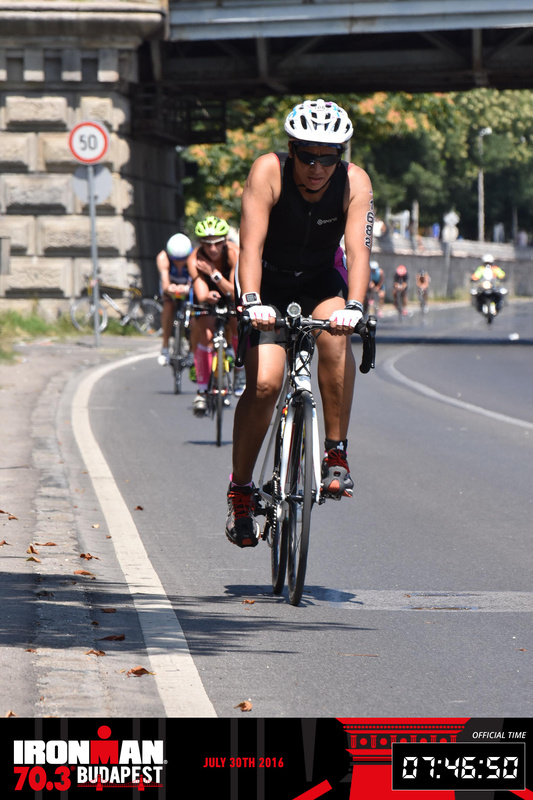 He bought a bicycle suited for the needs of the triathlon, a week before the event. He practised some bit, learning how to shift gears and ride alright on flat courses. Malaysia however had a course that went up and down. He struggled in the hills trying to figure out the right gear shifts, the right ratios. “ I wasted a lot of energy in cycling,’’ Idris said about the event. Result – running, which he does well, paid the price. It took him five hours to finish the marathon leg. But the Malaysia episode hasn’t stopped Idris from dreaming of Ironman. “ Now at age 50, I want to do an Ironman. 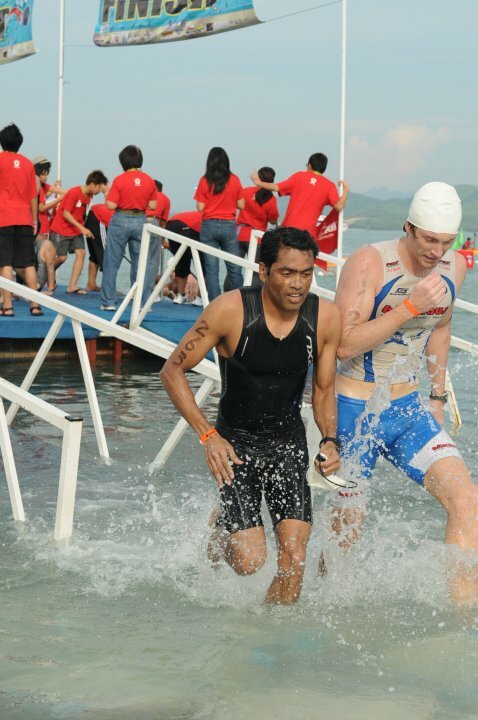 Hopefully, I can be the fastest Indian in my age group in the Ironman,’’ he said. Maybe an Ironman in Australia, he thinks, for his sister stays there. Else in Canada, where his brother lives. “ I want the course to be a fast one,’’ he said. That is among considerations. Age group also matters. “ I am beginning to get old,’’ he said, “ I want to set a benchmark for veterans. Currently I lay a lot of emphasis on strength training.’’ He lives a packed schedule. On Sunday, he runs two hours to build endurance. Monday finds him swimming in the morning and cycling by evening. Tuesday is a combination of swimming in the morning and hill-running by evening. Wednesday is reserved for stretching and yoga with a bit of cycling in the evening. Thursday mornings are kept for swimming; Thursday evenings for speed work-out. Friday, till afternoon, is prayer time followed by an evening run of 15-20 km. 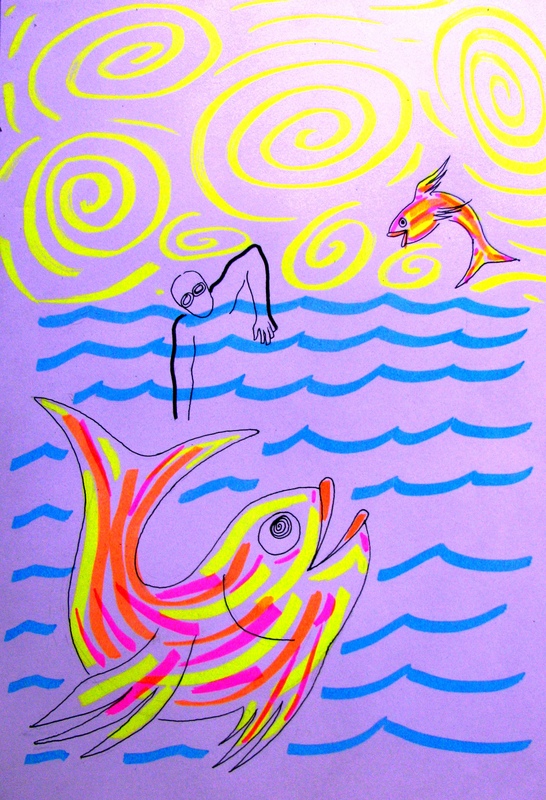 Next day – Saturday – he swims in the morning and cycles by evening. Idris does not have a specific rest day. He prefers to rest through variation in activity. However ahead of a race, this approach alters. He consciously rests for two days before races. Despite all this, back in 2003, when Idris ran his first marathon, he had finished it believing he will never do it again. His timing was decent. Problem was the state he found himself in. “ I was literally in pieces. I was that exhausted,’’ he said. Nevertheless as the story shows, he persisted. At his second BRR marathon, the timing was less – 3:10. Then came the big one – in 2009, he completed the full marathon in Dubai in 3:04. In 2011, he ran the London Marathon, finishing it in 3:17. His personal best (PB) yet in the full marathon is a perfect three hours, returned at a 2012 marathon in Bahrain. Same year he completed the full marathon along the Great Wall of China (it involves tackling 5164 steps) in 4:36, placing 23rd among 700 international runners. Next year (2013), he finished in the top 25 again at a full marathon in Phuket, Thailand. In 2013, he also participated in the Bengaluru Ultra. In 2014, he ran the Comrades ultramarathon in South Africa in 8:56, an admirable timing of below nine hours. In 2015, he moved back to India from the Middle East, a small whirlwind of sporting activity accomplished during his years in Bahrain. His father who had been running a school needed help managing it. Idris returned for that reason. What followed is perhaps the most engaging angle to Idris’s life. At most races he participated in, in India, Idris found himself on the podium. It intrigued the runner in him. His two children – a son and a daughter – were in senior school and mid-school respectively. Having invested his money well, – his investments had been mainly in real estate and gold – he had some assets yielding income. “ I asked my wife: what should I do? Should I go back to Bahrain? My desire was to run and make a living from it. When you have children, their education is top priority. For that, Chennai is better than Middle East. As regards money to support wife and two children – that wasn’t a problem. The only thing was – how will I kill time? Fortunately my wife agreed. She said: go ahead,’’ Idris said. Today, Idris is in an enviable spot; a position many men and women of his age aspire to be in. His life has been turned over to his passion – running. Running and winning in his age category, he now makes anywhere between Rs 30,000 to Rs 40,000 a month. He races almost every week. “ I am happy. The wife is also happy,’’ he said. In 2015, according to Idris, he participated in close to 32 races. In 2016, by the time we met him on the eve of the Bengaluru Marathon, he had already logged in 22 races. The running season spans July to January with most races happening in the months of July, August, September, October and November – that’s gladiator’s busy season. In April, TCS 10K is the sole major race in his reckoning. This situation wasn’t accidental. Idris admits that you don’t reach here without prior planning. “ This has been a drift in me since 30 years of age. We invested in apartments at that time,’’ he said, pointing to how he had prepared for the life he now leads. “ You can’t make this change all of a sudden. You have to plan for what you wish to do at age 55 or 65,’’ he said. So what’s his future in running, as he sees it? Although he ran the Comrades, going ahead, Idris does not want to court the ultramarathon. Reason – it slows him down. He recognizes himself as a fast runner. Plus, there is an emergent attraction. Being old and fast at once is both a challenge and a rarity. Not to mention – in that specific bracket of wanting to be fast despite age, competition is less, something important when you are running for money. Currently, that last observation is delicately poised. Idris knows that aside from people like Dinesh Kumar and Ashok Nath for competition, Bengaluru’s well known distance runner, Thomas Bobby Philip, will also be in his age group. There is no cake walk guaranteed. “ However honestly speaking, nothing about any of us really matters. Look at Haile Gebrselassie. At age forty plus, he completes a marathon in 2:15!’’ Idris said. In front of foreign runners, Indians have a long way to go. As he put it, his advantage is solely one of positioning in the market. 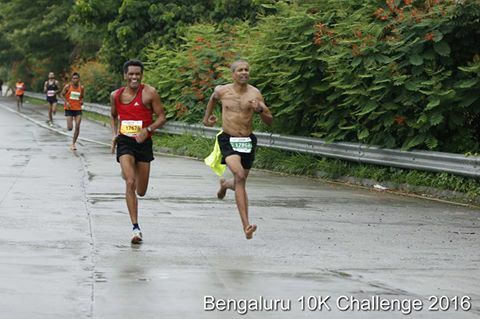 Right now in India, there are few fast runners in his age group. Out of them, the few who race seriously do so at a few selected events. Idris on the other hand, races every weekend. That improves probability of podium finish, provided he stays injury-free and nobody with a history of long, dedicated training – like somebody from the military’s sports set up – enters the age group. As one dwells on what Idris said, that would still seem a tight rope walk for he also concedes that age notwithstanding, he is “ as competitive as anyone else.’’ Competition and staying injury-free at the same time, is a tricky knife edge. New life in hand, Idris has everyone bought over to the direction he has chosen, save one person. “ My mother is not convinced that I made a good choice. She wonders how running can be a career. She tells me to come to terms with life,’’ the 50 year-old said. Much time had gone by since we sat down to chat. Having reached Bengaluru just that afternoon and with a race to run early next morning, Idris took leave. Along the way, he paused to watch for a while sport climbers tackling the vertical on the stadium’s artificial climbing wall. By next morning, race over, the results were out. Idris had won in his category of the full marathon with a timing of 3:04:08. Weeks later, he would also finish first in his age group at the 2016 Airtel Delhi Half Marathon with a timing of 1:18:57. The story of a woman, who overcame her fear, used what she had around her to train and completed a half Ironman. “ I wanted to do something in life rather than just get married,’’ Meena Barot said. It isn’t that her parents didn’t understand. The larger family and community she found herself in didn’t expect women to work. Most women married and settled down, raised families. If there was anything for a woman to gravitate to, it was that predicament. Born 1972 in Vadodara (Baroda) and roughly a decade later, shifting to Belapur in Navi Mumbai, Meena wasn’t one bit inclined to tow the community line. In her schooldays, she was into athletics and excelled at badminton. “ That sporting spirit probably brought some aggression to the table,’’ she said, mid-2016, at her neat apartment in Kharghar, where she stayed self-contained, two bicycles for company. Realizing early that India assigns set direction for girl child and one’s own effort is the only way to foray a different path, Meena kept busy. Continuing on to college, she worked part time while still an undergraduate. She did her PG Diploma in Pathology from Grant Medical College and worked full time at Hinduja Hospital as a lab technician for the next four years. “ I believe every woman should be financially independent. Dependence and relations can take a twist at any point in life,’’ she said, adding, “ you don’t need others to tell you that you are strong. You need to realize it yourself.’’ While still at Hinduja Hospital, Meena enrolled for a MBA in marketing from the Narsee Monjee Institute of Management Studies (NMIMS) and successfully completed it. She funded that MBA course entirely with her earnings. “ It was a struggle doing all that. But the struggle made me a strong person. My life to date has been my decision,’’ Meena said. Following the MBA, she worked for three years at a company called Becton Dickinson, shifting later to a smaller outfit called Shalina Healthcare, which though smaller, allowed her room to learn. 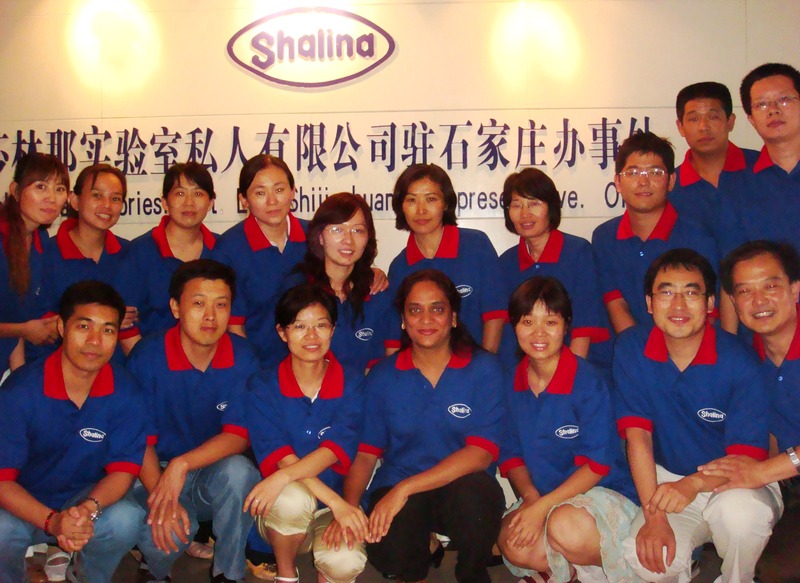 In their employ, Meena moved to Shijiazhaung near Beijing, tasked with setting up operations for the company in China. She had to do everything from scratch, from finding a place to stay to finding a place to set up office. Shijiazhaung had just two other Indian families. Indeed there were few foreigners in town. “ It was tough but the local people were good,’’ she said. Back in Navi Mumbai, for some time now, her father had known that his second child had no appetite for conventional womanhood. According to Meena, he maintained his views on life but rarely interfered with her choices. When she got the offer to move to China, she didn’t inform him at first. Once everything was in place and the shift was imminent, she broke the news at home. The China angle also came at the right time. With her siblings marrying and settling down in life, there was pressure on her to follow suit. China put an end to that. For the next five years – from 2005 to 2010 – she was based there. One of the highpoints of that tenure happened in 2008. 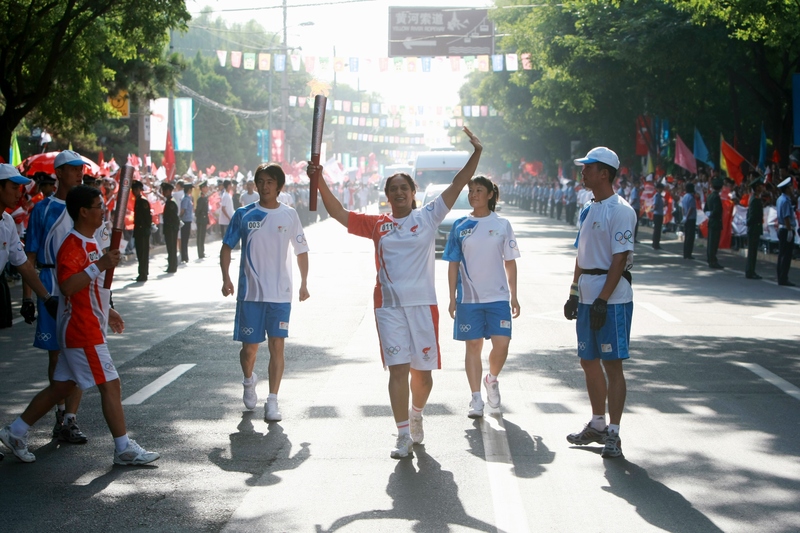 As the Beijing Olympics drew close, Meena who participated in a contest by Lenovo to choose a bunch of ordinary people who would get to carry the Olympic torch, found herself in the lucky lot. After the relay, she got a torch as memento; it is there at home with her. Setting up a company office entails much work. There was considerable stress. A year after moving to China, in 2006, she was diagnosed with hypothyroidism. It triggered weight gain; she nudged 90 kilos. Living alone and the long, lonely stint endured from schooldays, navigating her path in life – all that was also taking their toll. “ I was in the happiest phase of my life. Strangely, I was also depressed,’’ Meena said of that period in Shijiazhaung. What particularly depressed her was the loss of stamina. Going up stairs had become difficult. She joined a gym, working out regularly after work. It helped physically (she brought down her weight to 80-83 kilos) and while it did help mentally, it also posed a fresh problem – over time gym becomes boring. For engaging alternative, she joined a badminton coaching class, where the students were mostly children. That didn’t demotivate her, she kept up the routine till a new set of problems emerged – knee pain and lower back issues. 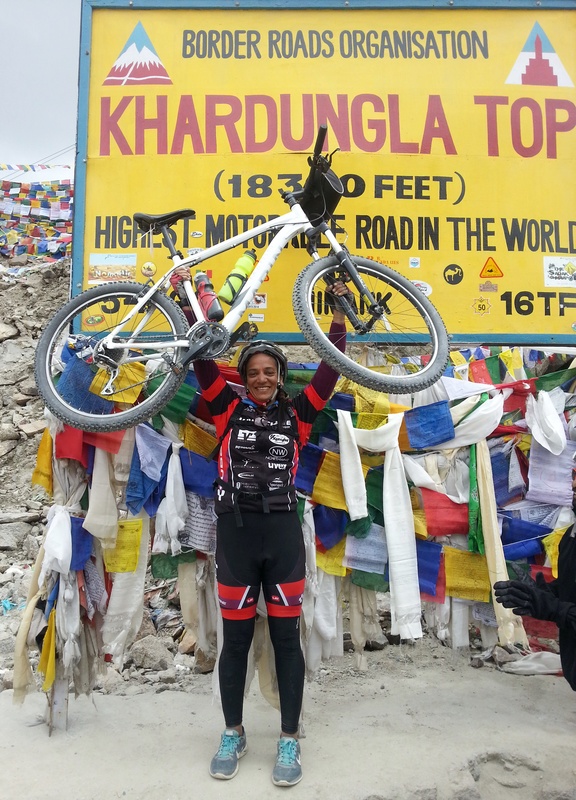 The doctor she consulted while on a visit to India, said, “ no exercise.’’ Once back in China, Meena took up cycling. She was getting on a bike after 25 years or so. It was a lady’s bike called ` Emily,’ single speed, no frills. She started cycling to office. Soon she was going everywhere on Emily. Around 2008, she bought a Giant MTB (mountain bike). The shop, which sold her the bicycle, also hosted organized rides. That way, Meena started riding 30-40 km on weekends. China is both the nerve centre of global bicycle production and home to a large number of people using bicycles for day to day commute. “ Half of our regular road in India – that is how much space they demarcate on roads for cycling,’’ Meena said. Her parents visited her in China. She remembers the visit for her father’s observation. “ I am happy you didn’t get married although I pressured you to,’’ he said. In December 2010, Meena moved back to India and Navi Mumbai. Reason was her father’s ill health. He had a heart problem having suffered his first stroke in 1987 followed by a bypass surgery in 1992 after his third stroke. In 2009, he was victim of yet another stroke; this time, severe. He had called up Meena in China and asked her to return. Not long after she returned, in March 2011, he passed away. He was 66 years old. Meena felt the loss, deeply. She had moved back to Mumbai with the same company that sent her to China. In India, she was tasked with setting up a new department and that involved considerable work. So much so, that within a week after her father’s demise she was back at her office desk. “ That got me thinking – what am I living for?’’ she said. The old depression was coming back to haunt. By November 2011, she had made up her mind to quit her job. It was a well thought through decision – she had cleared her loans, had some savings, endured a high pressure job with consequences and wanted to be done and over with that lifestyle. China had sent her back with a hobby for gift – cycling. She was now cycling regularly in Navi Mumbai. One of the friends she made so was P. V. Subramanyam (aka Subra). 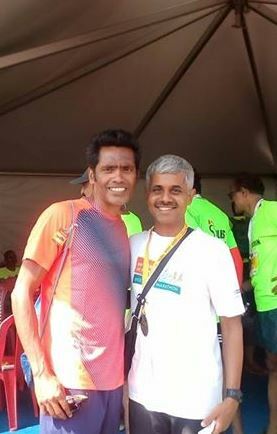 He was a member of Navi Mumbai Runners (NMR). He kept saying that Meena should get into running. By then, she had also linked up with Shalil Nair, one of the founders of NMR. In 2012, after her last day at work, she went out for a run with Nair who incidentally asked her about her background and realized that she was between jobs. He was Director, Human Resources at Institute for Technology and Management (ITM Group of Institutions). Meena was offered a job as part time lecturer at ITM Business School in Kharghar. “ I was thus unemployed for only eleven days,’’ she said. She sought six months break before joining. In that time, she did a cycling trip with Youth Hostels Association of India (YHAI) in Himachal Pradesh, to the Jalori Pass. One of the great challenges for people living alone is – what do you do with time? Bereft of human company and the evolving dynamics of person meeting person characterizing crowded Indian life, time sits still, a palpable quantum on one’s shoulders. A sense of engagement is essential. 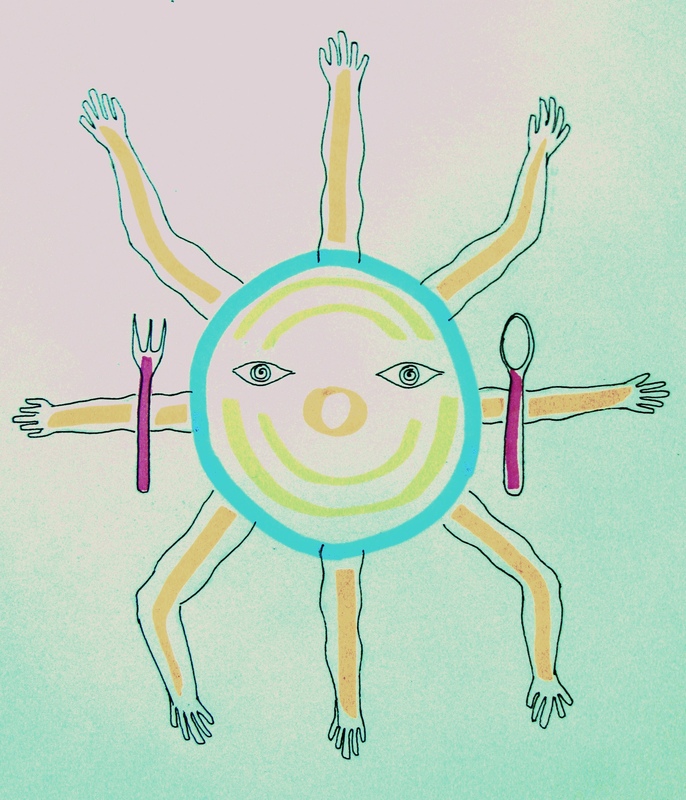 If you don’t have that, the very fabric of life – time, can turn against you. Still insufficiently engaged in life for a person of her nature, time was turning against Meena. Over January-June 2012, she was severely depressed. “ I had nothing to look forward to. The biggest issue was – what do I do with my time?’’ she said. The good thing about life is surprises lurk in every corner. 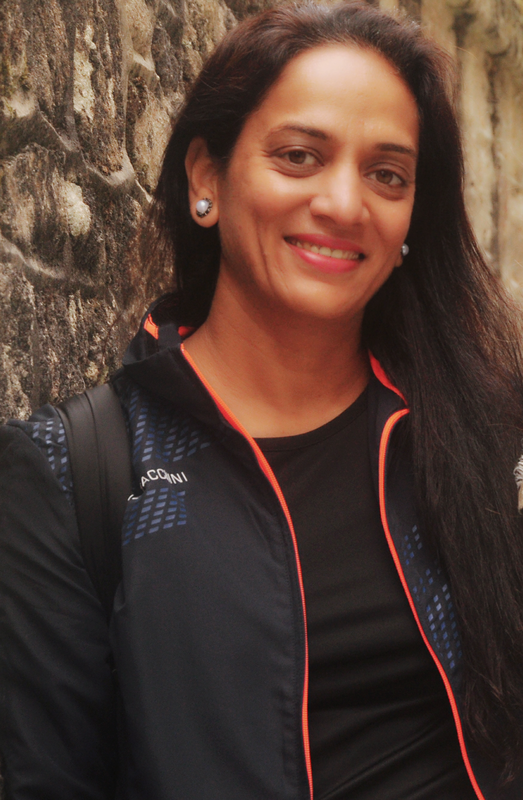 Kripa Sagar is Meena’s friend, met through cycling. “ I had heard about Meena from some friends. I met her sometime in 2011 after she returned from China. She was into cycling. Our first ride together was to Nere-Maldunga, off Panvel. She came across as a very unassuming, friendly and grounded person who was at the same time a strong woman. I enjoyed her company,’’ Kripa said. One day Kripa had gone cycling to Kharghar; she called up Meena and asked if they could meet for tea. “ I went over to her house. While sitting in the balcony, I mentioned to her: why not do Ironman? We both agreed to try,’’ Kripa said. Meena had neither done distance running nor did she know well, what Ironman was. She read up on Anu Vaidyanathan – among India’s best known triathletes – and lapped up what she could learn about Ironman. It was 2012. At least a half Ironman by 2016 seemed possible. Less than four years remained. As with China, it was another start, almost from scratch. “ Meena took on the challenge seriously and trained intensely. It was a very tough training session that she chalked out for herself. Some days, she would train for 7-8 hours. Many runners and athletes could not keep pace with her intense training schedule,’’ Kripa said. Although Ironman was an idea shared by both, Kripa had to drop out as she was committed to another project. 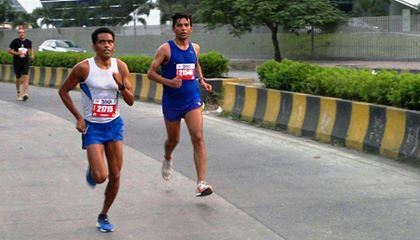 Ramachandra Rao is a senior runner living in Kharghar. He used to be an organic chemist and researcher with Ciba Geigy (now part of Sandoz). He got into running during his days at university in the US. Every morning, he and his wife (she likes to walk) go out for a walk and a run. 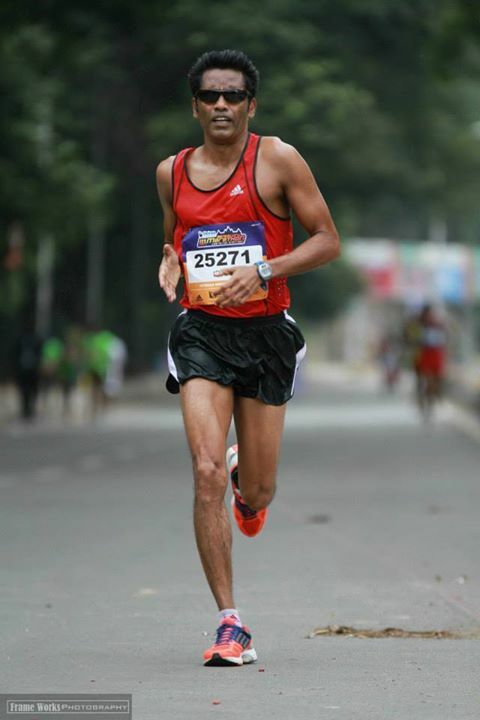 A quiet person and a dedicated runner, Rao is a member of NMR. He first met Meena on a NMR-run from Nere to Maldunga. It was some time before Rao got to know her better; that happened mainly because Lavanya Chillara, a runner staying in Rao’s housing society and Meena, used to run together. “ One thing sets Meena apart from others,’’ Rao said, “ others plan but often don’t do, she plans and executes meticulously. She is very committed.’’ According to Rao, once the Ironman idea was in, Meena went after it diligently. She had Daniel Vaz as her running coach. Off and on, Rao would run with her. “ In one year, she improved a lot from jogger to runner,’’ Rao said. By October 2012, Meena had run her first half marathon at that year’s Vasai-Virar Mayors Marathon (VVMM). The same year, she also got to know of the Brevet des Randonneurs Mondiaux (BRM) events in cycling and consequently rode 200 km from Borivali in Mumbai to Cheroti and back. Determined to improve, she found a cycling coach. Soon she was regularly cycling and running. By 2013-2014, she was securing podium finishes at some competitions. 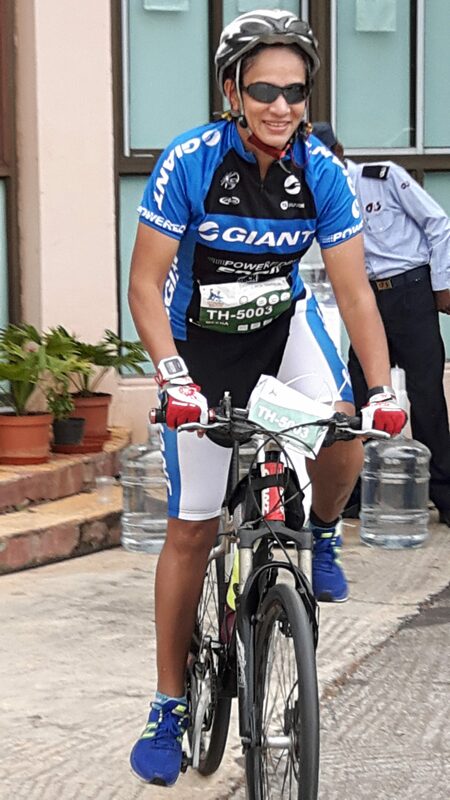 In 2014 she participated in a duathlon organized by Kripa Sagar – 100 km cycling plus 21km running. The cycling was from Navi Mumbai to Nariman Point and back, while the running was done on Navi Mumbai’s Palm Beach road. However, if the Ironman was to be goal, Meena had a major obstacle to overcome. She didn’t know swimming and, she was scared of water. In June 2014, she joined the Belapur YMCA’s coaching sessions to learn swimming at their pool. It taught her the basics. As was her habit, she kept working at pushing her limits. There was a big problem. She may have learnt to swim and overcome some of that fear of water in the process. But the Ironman event required her to swim in open water and the two – swimming in a pool and swimming in open water – are two distinctly different animals for those tackling water right from the basics. In one you have a sense of containment and accessible safety, in the other, you are on your own and safety isn’t quite at hand. Where was she to go for a taste of open water? The question is stupid in Mumbai-Navi Mumbai for the urban agglomerate is right next to the sea. But it is also one intense mass of human habitation and industrialized to boot. 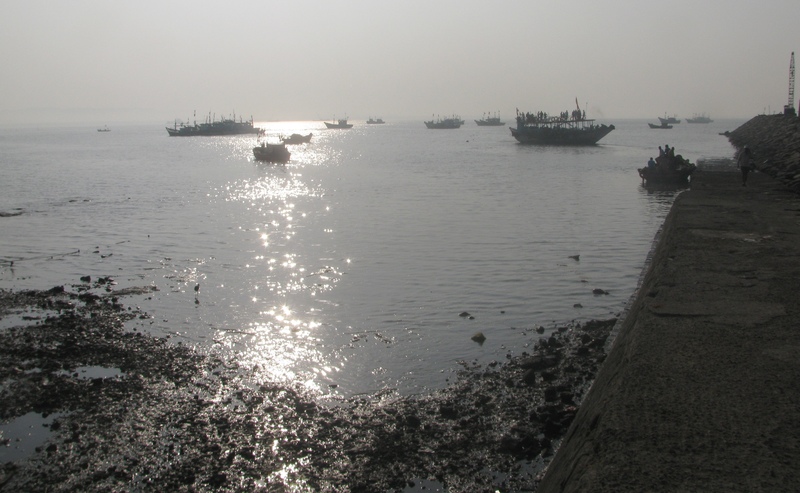 The sea around Mumbai-Navi Mumbai is polluted. To compound the problem, the coast in these parts sees significant ingress and egress during tides. Most beaches during low tide are an ugly sight with debris and garbage exposed; the scene sticks in mind even if you swam only during high tide. What do you do? 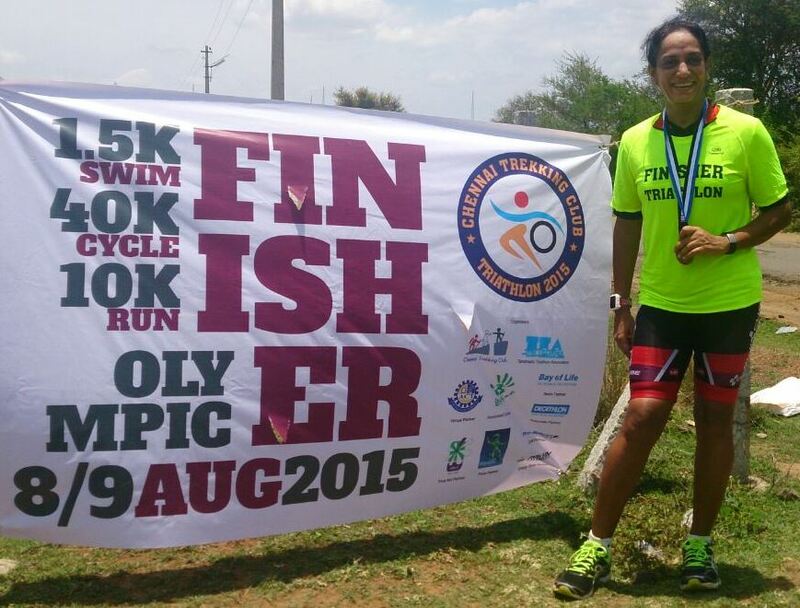 In the meantime, Meena had registered for the 2015 Chennai triathlon and the Hyderabad triathlon. Her running was improving; she had even ended third in her category at one of the editions of VVMM. She was also regular at the BRMs. Roughly two hours’ cycle ride away from Belapur is Karanja. It is on the edge of the sea. People come to the boat jetty here to take a ferry and cross over to Rewas. On a Sunday morning, a cyclist reaching here from Navi Mumbai would be treated to the not so dainty sight of muddy land surfaced in low tide, fishing boats with their hulls exposed in the receding tide and murky waters typical of tidal zones. It was to Karanja and its boat jetty that Meena turned to for familiarity with open water swimming. She was determined to go for an Ironman. She knew she had to make do with what was available. No point complaining. Accompanied by her swimming coach and good friend Ramachandra Rao, she frequented Karanja, where they went out in a rented boat with Meena subsequently swimming in open water supervised by her coach. “ The water was very muddy. It was also prone to tides. I was a bit concerned about her health, swimming in that water. Meena though had no hesitation in jumping in and swimming,’’ Rao said. Despite her efforts, she would remain a slow swimmer. At Chennai, it took her an hour and ten minutes to cover 1.5 km; at Hyderabad where the swim was in a pool, she needed an hour and twenty minutes to cover 1.9 km. Internationally the cut off time for 1.9 km is 1:10. Altogether, she took nine hours to do the half Ironman distances at Hyderabad. To compete in Europe in 2016, which she planned to, she required cutting this time by a whole hour. Then in December 2015, while working out at the gym, she injured her lower back. “ I just could not bend,’’ she said. In January 2016, running the half marathon at the Standard Chartered Mumbai Marathon (SCMM), she noticed mild pain in the left leg. At a cycling trip in Sri Lanka, which preceded SCMM, she had felt heel pain. She managed to complete the half marathon at SCMM in 2: 12. However the heel pain steadily worsened till it was diagnosed as Plantar Fasciitis. Post SCMM, there was no running and looming ahead in July 2016, was the half Ironman she had signed up for in Budapest, Hungary. To add to her woes, the 2015 monsoon season had been weak with resultant water shortage in the state of Maharashtra. By March 2016, many swimming pools in Mumbai-Navi Mumbai had shut. Meanwhile, to reduce the heel pain, the doctor recommended a steroid injection. By mid-April she was back to cycling and running. 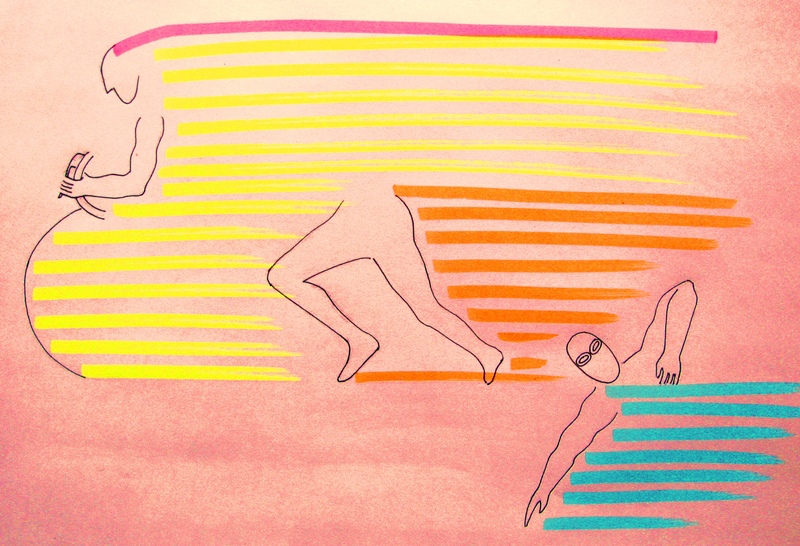 For swimming, it was Karanja. Then towards April-end, the heel pain returned forcing her to stop running. By May, she was left with only cycling to do. It didn’t end there. In mid-May, while training, she fell from her cycle. With that, she was off running, cycling and swimming. How much adversity will life throw at her? “ I used to cry a lot,’’ Meena said. Her friends told her to take it easy. On the bright side, she was able to merge an ITM trip to Europe, with the Budapest Half Ironman. In Normandy she found a place to run, cycle and swim. With weeks left for Budapest, she trained as best as she could. Ahead of the event, Ramachandra Rao – he had become instrumental to keeping her motivated – texted Meena regularly with positive thoughts. On July 29, a day before the half Ironman, there was a trial swim in open water at Budapest. “ I went into the water and panicked. I tried five to six times but I kept coming back. I was scared, it was psychological,’’ Meena said. There was a sense of endless depth to the water and seeming absence of limits nearby to the expanse of water she had to tackle. She decided against participating in the event. Some of the Indian participants told her not to do so and to at least swim up to the buoy midway. But as she did so, she panicked again attracting the attention of the rescue boat. The doctor on the boat shouted at her, “ what you are doing is not swimming! This is not a swimming pool. You will kill yourself!’’ Back on land, those comments hit Meena hard. From January 2016, given all the reverses life had thrown at her while preparing for the half Ironman, she had been battling depression. The universe didn’t seem to notice what she had done; all it appeared to see and enjoy toying with, was her nervousness in water. Suddenly her motivation crashed. She sat in Budapest, eating ice cream, hoping to lift her spirits up. “ I didn’t tell anyone back home what I was going through. The only person I called was Mr Rao,’’ she said. He told her to calm down and relax. It brought back some of her motivation. She decided to attempt the race. “ I know her potential. I was very positive that she will do it, provided she keeps her mind calm. I told her to remain calm and see that thoughts don’t disturb her mind. Don’t get involved in it. Always think that you have the ability to do it. It is easy to say so but to practise it in adverse situations, it entails much work,’’ Rao said. Meena also had a chat with a colleague from ITM, Deepthy, who got her to meditate. Thus calmed, she fell asleep. On July 30, race day, she decided to tackle the swim in segments and not visualize it as the entire distance it represented. She also told herself: it is okay to be last. What is important is to attempt the swim. “ If you don’t attack fear at the time it appears, then it sets in for life. I will then live my life knowing that I messed up at the starting point and didn’t attempt the race at all,’’ Meena said. Further as the medic’s shouting of July 29 showed, the rescuers were alert and good. She was in safe hands. She finished her swim just within cut-off time, in an hour and ten minutes. The organizers provide a grace period of 50 seconds. By the time she started cycling, the professionals had already completed their first 45 km-loop. But there was a pleasant difference to their cycling. “ They cheer you on,’’ she said. Both the cycling and the running went off well for her. 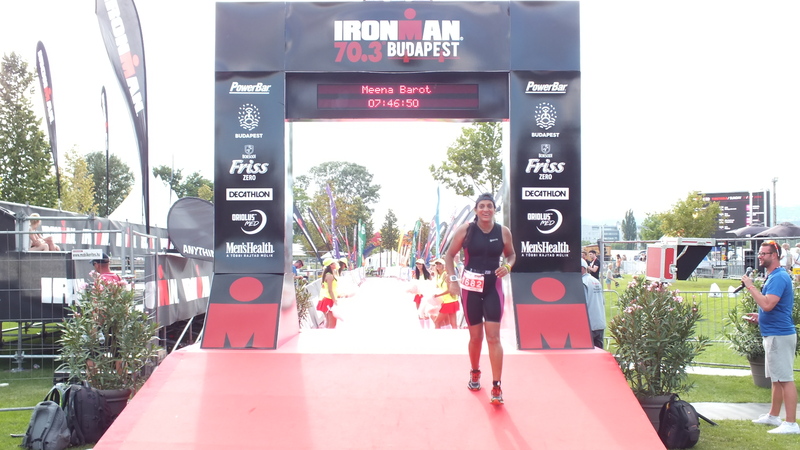 In the end, she finished the half Ironman in Budapest in seven hours and forty six minutes compared to the nine hours she took for the same distances in Hyderabad. Looking back, Meena credits the journey completed to hard work and discipline. She used to wake up at 4 AM and start training. Aware of her capacity for depression, she stayed off all forms of negativity. This included keeping away from people who were negative or tended to doubt her abilities. “ I was out of all social media groups – WhatsApp, Facebook, all that. I was in touch with only those who were positive,’’ she said. “Rao sir’’ was very important in this framework. “ Never once did he say, don’t do it. He always said, you will do it,’’ Meena said. Uniquely, Budapest taught her to relax. “ I don’t have to prove a point. I am happy with the place I am in, right now,’’ she said, explaining her learning. 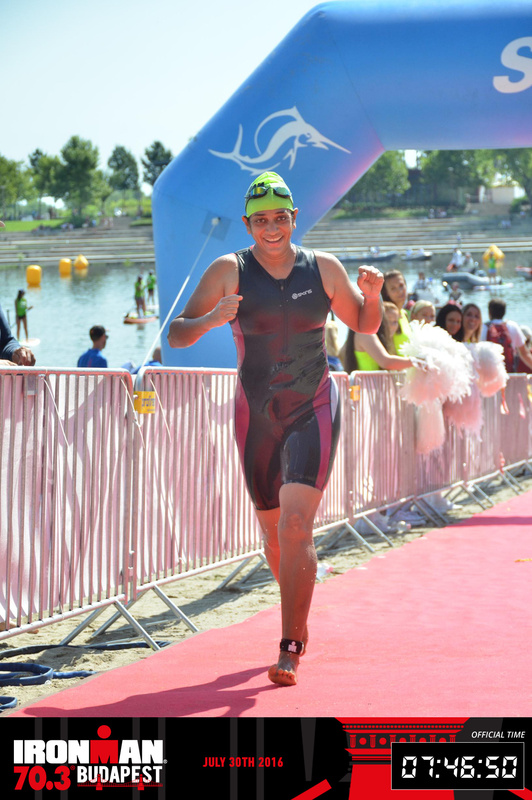 Meena hopes to do a half Ironman every year. During the day, Mumbai’s railway stations are typically crowded places that become more crowded whenever a train arrives. Here and at equally crowded nodes on the city’s streets, small eateries and tea stalls exist that work at frenetic pace. One such eatery, at the railway station I frequent, has long been halt for a plate of potato vada (served with mint chutney and spicy chilli-garlic powder) and a cup of tea for me – a sort of cheap brunch freelance journalist treats himself to. There are two such stalls at the railway station, one each at its two exits on the side of town I live in. The vada is tastier at the place I patronize. You may notice a moment of relaxation here and a moment of relaxation there but otherwise almost everyone working at these eateries stays busy. 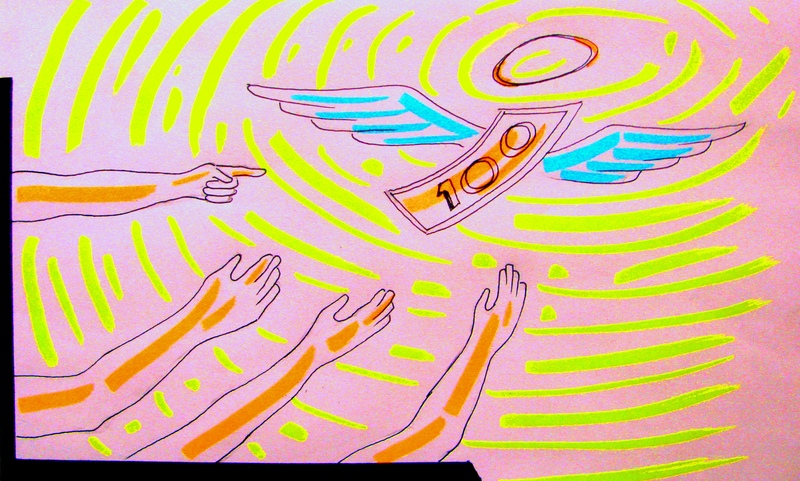 The manager accepts the money, pays the balance, shouts the order and keeps a watch. At the same time, his assistants hear the order shouted, wipe a plate clean, find the required food item from the several kept around and serve it. The whole sequence from payment to serving food takes less time than what would be required to either swipe a card for digital payment or do one of those phone-based electronic wallet-transactions. Thanks to demonetization, overall business has dropped a bit, for people rattled by shortage of change hold back on expense. Impulsive expenditure like a cup of tea or a snack, are among the first things to get put off. Seeing the manager enjoy a rare moment of quietness, I asked him whether the Indian government’s evangelism for digital payment would work in his case. He smiled. “ I own two establishments here,’’ he said, pointing to a tad more fashionable joint next door, visited by college students. The one freelance journalist goes to is an older working class type-eatery. The college crowd-joint had a suitably attractive name and slightly more expensive food – rolls, sandwiches etc. “ I installed a card-swiping machine there,’’ the manager said, “ but the telecom network has suddenly got loaded with traffic that it takes a long time to make a payment. As for the place where you have your vada and tea, here the pace of work is so fast that a swipe machine or an electronic wallet would fail to keep pace. In the time I swipe one card, under normal circumstances I would handle five or six customers, quite likely more. Besides, a machine does one job at a time. As manager I am doing several jobs at once – while I am accepting money and giving back balance, I am shouting the order and also keeping an eye on whether the orders are being attended to, even who is taking what from the refrigerator. I am also being flexible, negotiating and taking spot decisions as I go along. Electronic transactions have one value for sure. A record of transactions is automatically kept. It makes the daily tallying easier. But we anyway do that with some marginal, negligible error. By and large for our work at this eatery, none of the digital fads are relevant. Hopefully, in some days the problem with change is sorted out and we are back to the old level of hectic work,’’ he said. I wondered if realities like this find place in the wisdom of the day, deciding how India should live. “ Are you sure you want it all machined down? How about some longer strands up front so that you can comb it sideways?’’ the hairdresser asked. My vision for hair was however as clear as my bald pate. For some time now at the salon, my choice of instrument has been the electric trimmer, popularly called “ machine.’’ Use it like a lawn mower. The hairdresser seemed disappointed at prospect of art, declined. But he was an efficient craftsman. The job was accomplished in a jiffy. It cost Rs 70. I reached for my purse to pay, not quite happy to lose another hundred rupee note. Smaller denomination notes had come to resemble precious stones slowly brought to the surface by the earth’s crust building activity. They were in short supply and the Reserve Bank of India’s pace of note printing harked of crust building; it was taking a million years for the tsunami of demonetization to settle down with new equilibrium in liquidity struck. What’s in short supply, you hate losing. I didn’t want to lose the diamonds and rubies in my purse. Who knows when they will resurface next? That’s when I noticed the new EPOS device with the hairdresser. You can swipe your debit card after a haircut. Things had changed. Between the best known dictionary meaning for `change’ and its connotation as small denomination currency, it is the latter that dominates imagination in end-2016, given days spent wondering what to do with that museum piece of a new denomination – the 2000 rupee note. Nobody wants it and yet that is what is spewed out by the few ATMs functioning. I remember standing in a queue of amused folks at a D N Road ATM, the machine gifting everyone exactly one 2000 rupee note, a splendid invitation to financial uselessness. In a way you could say the unexpected move to demonetize the old Rs 500 and Rs 1000 notes is change in the classical sense but the fun is clearly lost in the larger drift to a cashless economy suddenly thrust upon us. 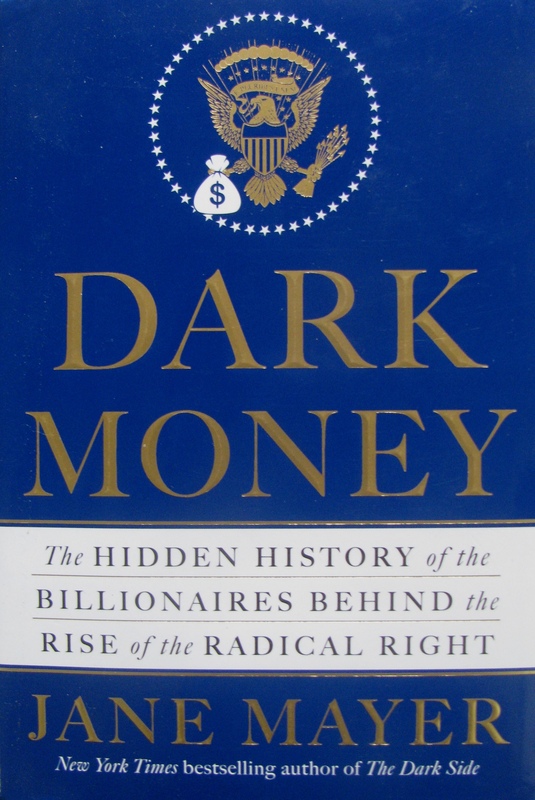 November 8 was a tsunami, the ocean floor slipped beneath liquidity in the economy. What has survived as perception of such forced change is satire, cynicism. Let’s not get into demonetization politics for this article isn’t about my financial troubles. It is about strands of old memory that surfaced in brain navigating the long bank queues and cashless ATMs of Mumbai following demonetization. What a change! Damn change! Is this change? For whom are we changing? Change is the only constant. – There were many thoughts running through my head. It was the first working day for banks after demonetization. The queue I was in, snaked out from the bank to bright sunshine outside. In these days of humans defined by life indoors and worries over complexion, the queue tracked every nook and cranny of available shade, making it seem, a rather lethargic anaconda, one idling to digest after a mammoth meal. What had it swallowed? The new government – I thought; tough food to swallow and much ache in the tummy afterwards. Whatever, it was change from previous diet and standing in queue had been dressed up by demonetization propaganda as nation building, patriotism, fight against corruption and black money, so on and so forth. I suspect the real reasons lay elsewhere. But at my level as ordinary citizen, my suspicions are merely private conspiracy theories and knowing that well in land overwhelmed by 1.3 billion people, I choose instead to bury my head in ruminations about `change.’ It puzzles me how a word that denotes something as remarkable as day changing to night and shifts of such scale as change of season, got entangled with money and its transformation to smaller denominations. `Change’ loses something of its natural magnificence through association with dull money. God or whatever that point before everything, said: let there be change and a whole universe birthed itself from nothing. Compare that to change by demonetization or life reduced to hunting for small change. It is distraction ruining appetite for universe. Somewhere between banks, the hair cutting salon and the next ATM without cash or one gifting 2000 rupee notes, thoughts about `change’ made me recall an old hair cutting salon in distant Thiruvananthapuram. The Internet now tells me that Brut, tucked away in Mascot Hotel, opened in the late 1970s; 1979 according to one write-up. It was already up and running by the time we got to know of it. What I remember is this: the first person from my family to patronize Brut was my father’s first cousin. Unnichettan’s neat hair cut was my inspiration. I was in high school when I followed in his footsteps to Brut. The place was expensive but the folks there did an excellent job. Of particular interest to me was that the salon played music. They had a Philips turntable with built-in amplifier, a pair of speakers and a young hairdresser with streaks of dyed hair – those days that spelt `different’ in capital letters – who kept a collection of LP records. He played music while crafting hair. At most other shops an older lot of hairdressers clipped hair to the drone of daily news or film music that at least, some of the young had long lost interest in. It was the disco era. Trendy youngsters grew their hair tad long; it was combed tight above the ears and the more courageous, sported streaks of dye on either side of the head. 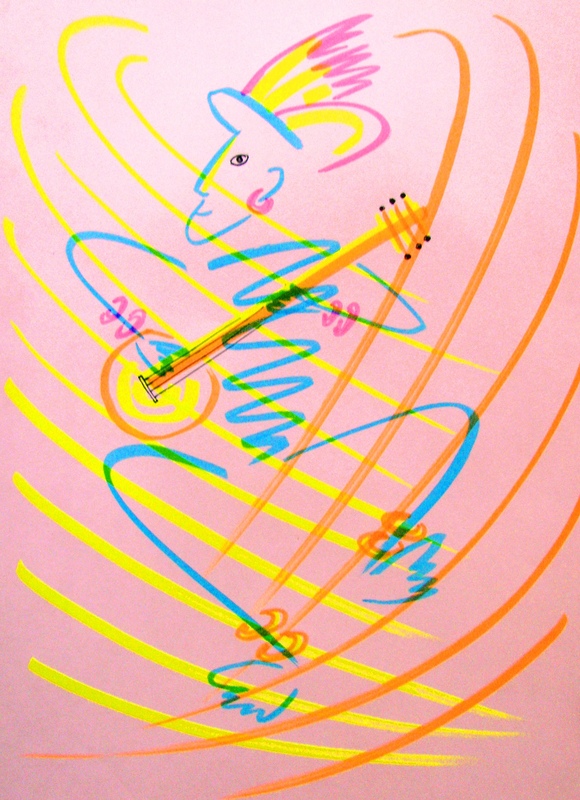 I was pretty tame in that department but I suspect, rather adventurous in other tastes – including music. At one sitting in the salon, I fell in love with the disco music being played. I remember asking the hairdresser for the LP cover. It was the album The Glow of Love by the Italian-American post-disco group called Change. The songs I had fallen in love with were A Lover’s Holiday and Searching, featuring the late Luther Vandross. To my luck, the album’s cassette version was available at Quilon Radio Service, which in those days had a counter selling music. I lost my hair; disco disappeared. But those two songs by Change always make me happy. Now if only all change was so.